Lovely for spring under a jacket or worn on its own, this contemporary and fresh pullover pairs a simplified, modern colorwork motif at the hem with a feminine and flattering shaped fit. In warm-weather cotton blend Valley Yarns Conway, it’s comfortable and cool. 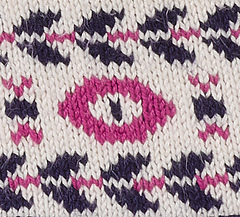 This pullover has a graphic yet simple stranded colorwork motif at the bottom hem. Worked in the round to the armholes and then back and forth to the shoulders, it has a squared-off scoop neck and waist shaping. Sleeve and neck bands are worked in the contrast color yarn. Elbow-length sleeves are worked in the round from the shoulders with short-row shaping.